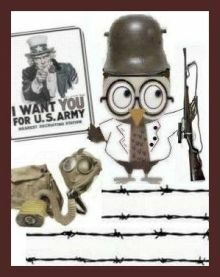 Owltecher.com's ideas to teach World War I! Teaching about World War I? Check out these ideas to inspire you and your students! 1. Create a World War I Journal. The student could use this journal to keep their thoughts, ideas, guesses, feelings, and opinions about what they learn during this unit. 2. Locate and label each of the main countries involved in World War I on a world map. Color- code your labels to show the three main groups: the Central Powers, the Allies, and the countries that remained neutral. 3. Study about and research war bonds. 4. Research music written during World War I. Listen to the lyrics and melodies. What do you think this music added to that era? You may be able to find recordings of music from this era at your library. If you are talented musically, play some of this music yourself. 5. Research some of the inventions brought about, or improved, during the era of World War I: the U-boat, the machine gun, the tanks, and the airplane to name a few. 6. The food for the soldiers of World War I, particularly those on the front lines, was terrible. Portable food and cooking methods have greatly improved. Research foods that would have been eaten by soldiers by then … their rations … and then find out what kind of rations soldiers have available to them today. 7. Create a timeline of World War I events. 8. Go to your local library and locate and read newspapers from the World War I era. Very often these will be available on microfiche. 9. Are you aware of any relatives that served in the military during World War I? Find out about them and their life before, during, and after the war. 10. Find out why soldiers were called “doughboys” during World War I. 11. Many soldiers died without ever seeing action during World War I. Research the epidemics that struck around the world during this time period, most notably the deadly influenza. 12. The United States opted to say neutral at the beginning of World War I, but Americans profited from the war by selling goods to European countries. What is your opinion on this? 13. The United States was called isolationist because it did not want to get involved in international affairs. What are the pros and cons of being concerned only with your country? What role does the United States play in the affairs of the world today? 14. Research the Sussex pledge. 15. Draw an imaginary trench. How you would set up your trench? What strategies might you use to protect yourself from the enemy? How would you protect yourself from the weather and the elements? 16. If you were old enough to join the military in 1917, would you have volunteered to go to Europe to fight in World War I? 17. Research several battles of World War I. How do you think they are different from the battles fought in today’s military campaigns?